Hours spent behind the wheel bring along with stress also back pains, sore necks, and headaches. 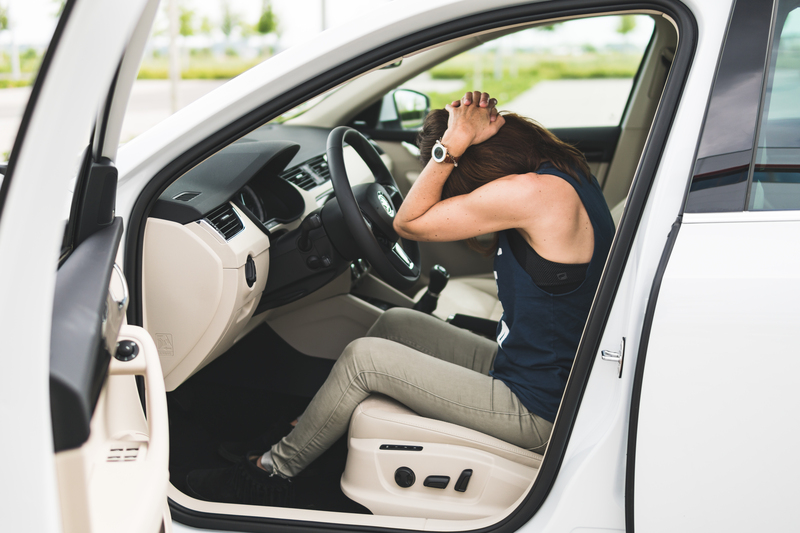 Have a look at how you can fight the pain and get relief from stress while in the car. Our society has truly changed: everything is about progress, about being better, about moving forward. Time management is essential in these stressful days just to get as many things as possible done. At the same time everyone runs to the next yoga class in the evening. It seems as though the training bag is always ready to go. Just to get free your mind of thought. Just to: relax! Sounds quite simple, but why use more precious time to do so? 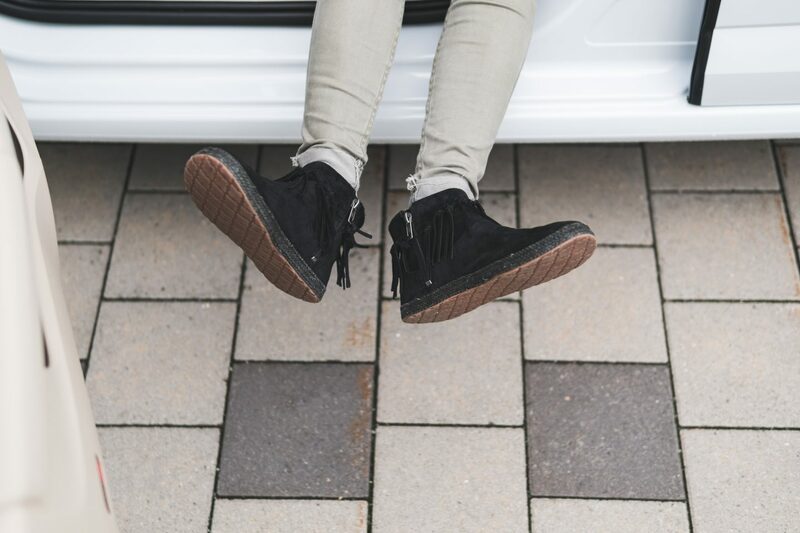 A beautiful opportunity jumps at us almost every day: in the car. 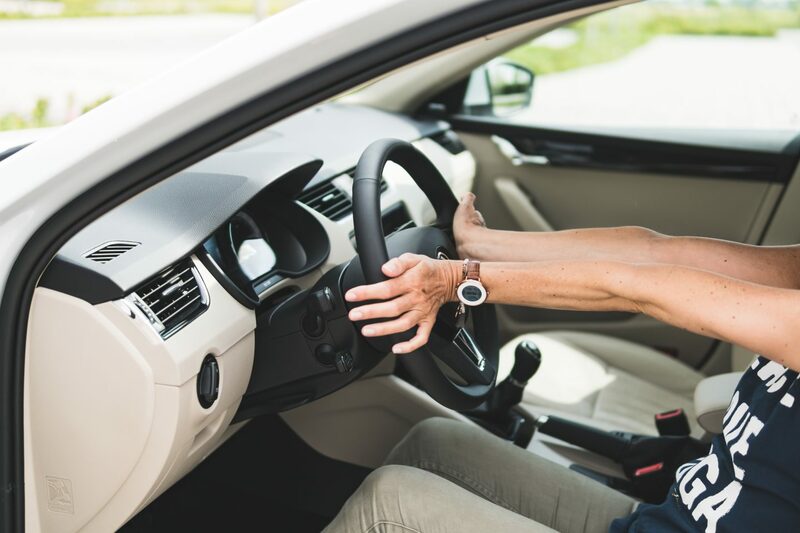 Thirty one percent of the average population spends at least one hour in the car every single weekday. Let’s not talk about the weekends. It’d just get worse. 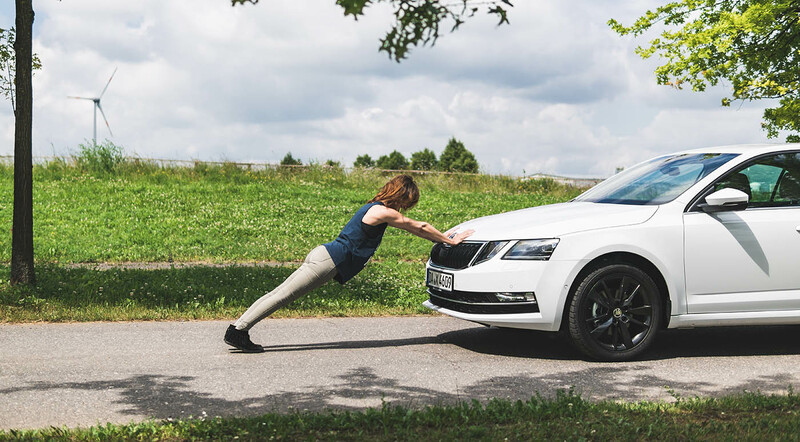 No wonder muscles in the neck get stiff and legs begin to ache, even in the best ŠKODA. If there’s traffic on top and the queue of cars seems to have no end, all you need is creativity. Or: our Yoga it! instructions. „When stuck in traffic, most people use the time to check their Instagram or to update their status on Facebook. As if anyone wants to know you can’t move. 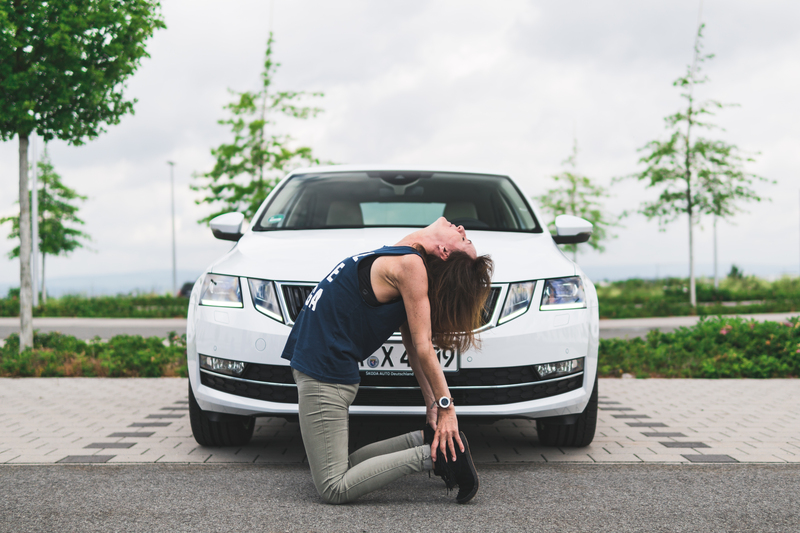 Why don’t you pay attention to your spine for once?“ asks Kerstin Emge, professional yoga teacher and expert on in-car entertainment. In order to start, lengthen your front torso through the top of the sternum. Inhale deeply, hold your breath for a second and then exhale slowly. By exhaling slower than inhaling you can calm your body down and you’ll be fresh again in no time. Talking about a straight spine, why don’t you try a twist as well? Again, lengthen your front torso, exhale and twist to the right side. 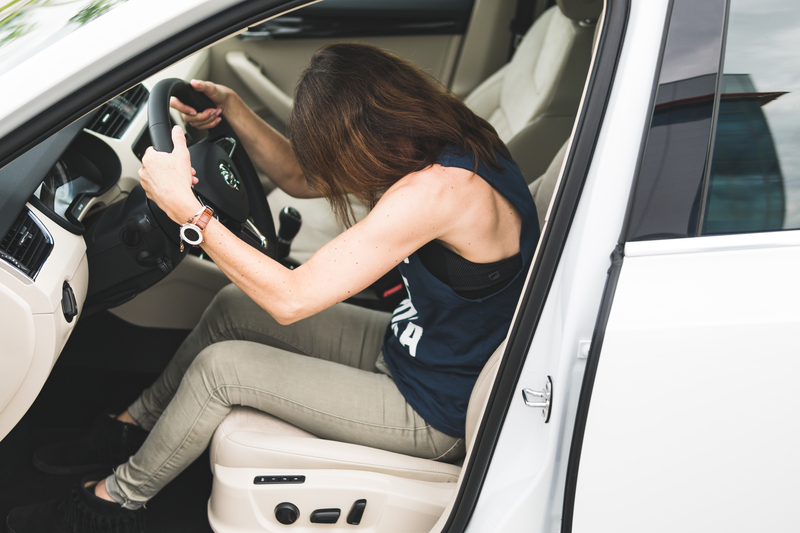 Press the left hand against the handbrake and pull your front torso even further. Repeat on the left side and pull with your right hand on the handgrip. Speed up your shoulders: Put your right fingers on your right shoulder and your left fingers on your left shoulder. Your elbows face the car windows. Now all you have to do is rotate. Rotate to one direction and then go on to the other direction. RELAX IN FRONT OF RED LIGHTS! If for once there is no traffic jam, you can use the short time spent waiting at a red light. Put your right fingers on your right shoulder and your left fingers on your left shoulder. They should look like big spiders ready to attack. Your elbows face the car windows. Now all you have to do is rotate. Rotate to one direction and then go on to the other direction. Red light quick start: If your hands start to feel heavy and lazy, just relax them with those easy and fast stretching exercises. 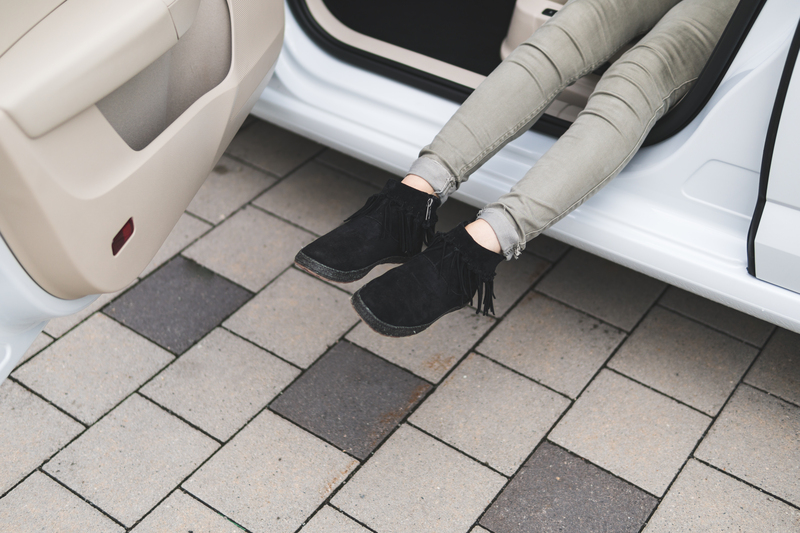 RELAX NEXT TO THE CAR! Motorway service areas suffer from a very bad reputation: expensive but disgusting food, less parking spaces than people and crying babies who are desperate to be fed. But if you are lucky enough to have caught a good spot, use it! Get out of the car and stand straight. Contract your front thigh muscles to lift your kneecaps. Exhale and bend forward from your hip joints. Make sure to move your head and torso as one unit. Try to put your ribs down on your thighs. It’s too hard for you? Just bend your knees until the ribs reach your thighs. Then slowly straighten your legs if possible. This asana helps to stretch your hamstrings and your pelvis which are the protagonists when it comes to driving. With a helping hand: Apart from doing all those asanas next to and in the car you can also use your partner in crime. Open the window and put up your straightened leg. You don’t feel anything? Then flex your right foot! Voilà! The most important thing while sitting behind a steering wheel is quite obvious: concentration. No matter whether coming home from holidays or a business meeting: Being tired and exhausted is nothing new in these situations. But don’t worry, there's an easy escape. Just take a break and fill your body with new energy. So if you still have a long distance to complete try warrior 2. Stand straight in front of the car. Your back faces the door. Then step your feet 50 cm apart. Your right foot should be close to the front wheel and the left one close to the rear wheel. Now rotate your right foot 90 degrees to the right side and your left foot 45 degrees also to the right side. Then bend your right leg until your thigh is parallel to the floor. While doing this strengthen your left leg. Stretch your arms away from the shoulder blades, also parallel to the floor. Avoid leaning your torso over the right knee to prevent injuries. Look over your right hand. This asana gives you self confidence and determination! And: come on, who doesn’t need determination when driving in the rush hour? Apart from doing all those asanas next to and in the car you can also use your partner in crime. Open the window and put up your straightened leg. You don’t feel anything? Then flex your right foot! Voilà! RELAX TO LET OFF STEAM! Well, that sounds quite superficial. But the street is not just a street. It’s a war zone! Drivers always forget their good manners. They swear, they stress, they shout. If you find yourself in this kind of situation take the next exit and park somewhere suitable. Get out of the car and go into mountain pose. Concentrate on one spot. Now put your weight on your left foot and lift up your right foot. You can either put it on the left foot, shin or thigh. As far as you want to go. Make sure you never put your foot on the kneecap. came to yoga thanks to her bad back. As medicine and fitness workouts did not help, she discovered yoga as the perfect cure. That was seven years ago now and today she is teaching her classes in her own studio kerstin.yoga in Mainz together with two other teachers. 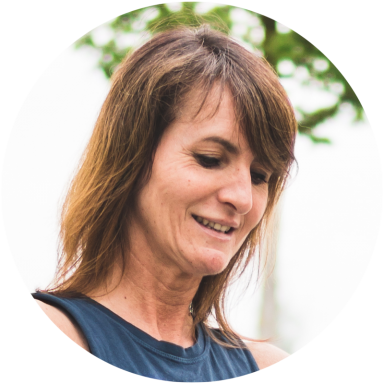 Certified by the American Yoga Alliance as a Vinyasa Flow Power Yoga teacher she welcomes every yogini and yogi, suitable for all levels of skill.